When implemented, CareConnect will streamline and improve existing processes and bring the UCLA Health System to the next level of excellence. To support that effort, the 15,000 future users of the electronic health record will need to perform work at the highest level authorized by their licensure or certification as defined by scope of practice standards. A Scope of Practice Work Group was given the task of clearly defining those roles within CareConnect. "We had to understand the scope of practice of each of the clinical and non-clinical staff members in today's paper world and make sure we allow them to continue to function efficiently in the electronic world," said Bernard Katz, MD, who served as one of two chairpersons of the work group and is medical director of the UCLA-Santa Monica Bay Physicians Group, which has been using a different electronic medical record system for three years. "We don't want the doctor to have to touch every order, task, or message because in an electronic world, it's easy to push everything to the doctor. We need to push as much as we can to the staff, while making sure they remain within their scope of practice." 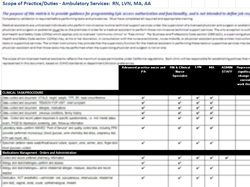 After several review sessions, the work group created a series of matrices that outline tasks for more than 20 typical roles at an ambulatory clinic -- for everyone from medical assistants and social workers to physicians and nurses. Katz said the scope of practice standards will help improve efficiency. 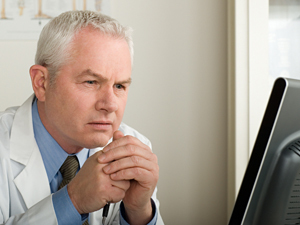 While physicians have the ability to check in a patient, order diagnostic tests, and schedule follow-up visits, it would be appropriate to have other staff members complete those tasks, Katz explained. "It's much better to figure out what it is essential that [physicians] do -- take a history, examine the patient, document the diagnostic tests that need to be done, and meds we want to order, and let someone know when we want to see that patient back. Let the staff do all the other functions so we could see more patients," Katz said. The scope of practice matrices, created by the work group, underwent an extensive review by the UCLA Health System's compliance office to make sure they are in accord with laws and regulations. "It's a difficult balance to achieve -- looking at the scope of practice allows us to maximize everyone's efficiency in CareConnect. But sometimes the interpretations about scope of practice have not been consistent with the regulatory language. We've reviewed the roles and come to a consensus about what is and is not within the scope of practice for various individuals. We needed to review those standards to make sure we don't create a structure in CareConnect that lends itself to noncompliant behavior," said Marti Arvin, chief compliance officer, UCLA Health System and David Geffen School of Medicine at UCLA. Clearly identifying roles within CareConnect will make it easier to prevent unauthorized access to patient information. "I think CareConnect will substantially improve the compliance infrastructure by not permitting non-compliant behavior -- security settings that don't allow certain users to do certain things by virtually creating technology controls for particular functions," Arvin said. "It also allows you to eliminate many of the errors you get with human intervention." Katz said he is looking forward to the improvements CareConnect will bring. "It's going to be a lot of work to learn a new system, but I think CareConnect is a great system, and I'm excited about the functionalities it will provide. I think it will help us efficiently coordinate high-quality care," he said. The scope of practice matrices developed by the work group will be reviewed by CareConnect's Executive Oversight Board before they are finalized. To learn more about the scope of practice guidelines or CareConnect, send us a message on our Contact Us page or send an email to CareConnect@mednet.ucla.edu.